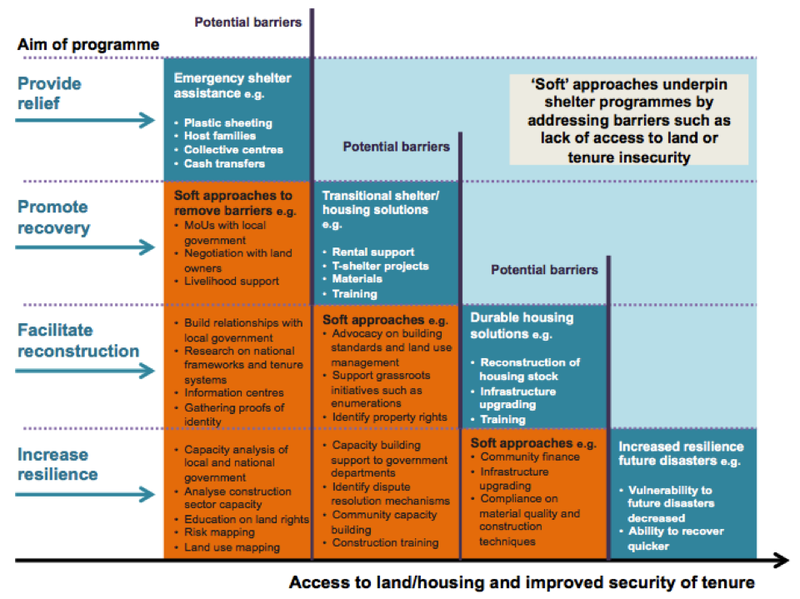 With differing mandates, varying entry points of intervention, and a multiplicity of timescales and intended programme outcomes, how can we try to visualise how different NGOs working on shelter programmes look to address issues related to housing, land and property rights (HLP)? In Part 1 of this post I gave a quick overview of some of the discussions that took place at the last UK Shelter Forum around how NGOs working in shelter engage with HLP. I also linked to the briefing note that Fiona Kelling and I wrote to summarise and frame these discussions, based around three headings: aims, approaches and sectoral capacity. This diagram seeks to demonstrate that while shelter programmes designed by organisations may have different intended outcomes (e.g. providing relief, promoting recovery, facilitating reconstruction, increasing resilience), problems with access to land or security of tenure often create barriers to these outcomes being achieved. In order to address this, examples of ‘soft’ approaches are identified that can be undertaken in order to remove or reduce barriers. These ‘soft’ actions address HLP barriers and underpin shelter programmes through making moves towards supporting disaster-affected individual’s access to land and improving tenure security. If these actions are not invested in early on then this may create delays or reduce the housing options available to disaster-affected households. 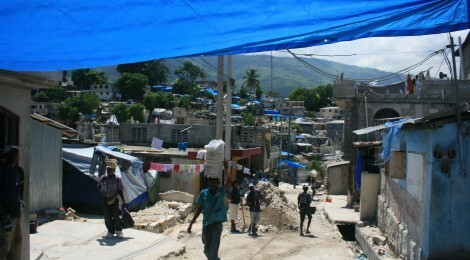 This also raises questions about timing and processes, linked to what David discussed in his previous post, and looks to ask: what actions can be taken in the early stages following a disaster to support an incremental process towards increasing access to land and housing, as well as improving security of tenure? One question arising however, is how do the intended outcomes of a shelter programme fit with the longer-term recovery processes and aspirations of affected individuals? How do these intended outcomes of shelter programmes influence what actions are prioritised at this early stage, and are these early actions sufficient in supporting processes beyond the scope of a shelter programme? Also, how do partnerships and handovers between organisations navigate these barriers, where the aims of one organisation may differ from another? What does this imply for the groundwork that needs to come before? This diagram is a work in progress and we would welcome any comments or feedback on its potential usefulness and how it could be improved.